God our Provider | This Thing Called Life . 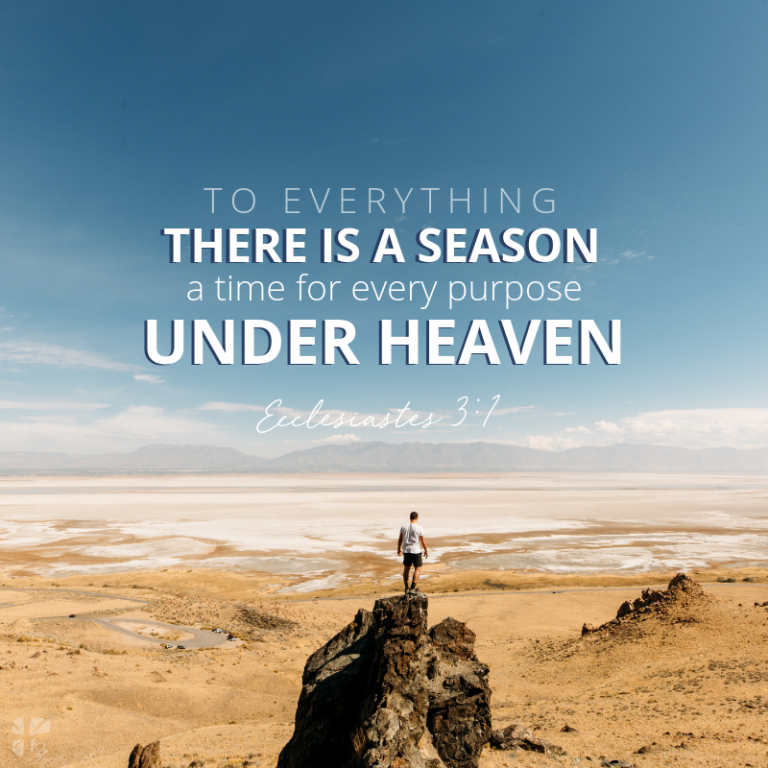 . .
Today I’m sharing an article by Dr. David Jeremiah that was published recently on FaithGateway. Ecclesiastes 3:1-8 — Why has this passage endured the ages as one of the oldest philosophical poems in our literary canon? It’s certainly among the most pensive passages of God’s Word, a beautiful meditation that casts a near-hypnotic spell over readers of any generation. The author was the wisest and wealthiest man who ever lived, and this book is a chronicle of his lifelong quest for true happiness and joy. Solomon tried wealth, wisdom, work, and wild living. At the end of his wide-ranging experiments, he concluded that everything was an empty exercise in vanity. It was like trying to capture the wind in his hands. I would not have chosen cancer as a path to spiritual growth, nor would I wish such fear and pain on anyone. On the other hand, I do not see my illness as a random event, some miscellaneous accident of health. And I do not believe there was a moment when God was absent from the physical, emotional, and spiritual crisis I endured. In fact, I found Him everywhere during that time. I found Him as never before. I glimpsed His face among the doctors and nurses who cared for me so skillfully. I saw Him there in shining power among the family of my church, and intimately among the family circle of my wife and children. He met me in the private chapel of my soul, where with each passing day I felt deeper in His grace and comfort. I found my Lord more present and more powerful. Knowing there must be pain and suffering for us all, I dearly wish everyone could travel the road I did. I wish every human soul could see the face of God in the fear and turmoil. So many walk a very different path; they experience only His absence. Rabbi Harold Kushner, the author of When Bad Things Happen to Good People, when his own three-year-old son contracted a rare disease that took his life at a young age, penned his conclusions about God and suffering in order to provide answers to others in similar circumstances. How can God be both perfectly good and perfectly powerful? The suffering in the world suggests that if He is God, He is not good; or that if He is good, He is not God. In other words, there must be something lacking in either His love or His strength, or He would cure every little pain. Rabbi Kushner worked through the old enigma. He concluded that God is all-loving but not all-powerful. He cares deeply about the people He created, but after creating the world He backed away and allowed it to run without His interference. Solomon had a different view entirely. He concludes that God is sovereign and in control, regardless of the imponderables that remain. Solomon sees God as being present with us but not helpful enough. The king wants to know why God does not improve the standard of life, do something about the aging process, show more favoritism to His children, and perhaps discontinue the program of human pain. In his poem, there are fourteen negative statements and fourteen positive ones, and they fall into three separate categories. The first describes the influence of time on our bodies, the second focuses on our souls, and the last deals with our spirits. And Solomon’s main thought? Well, it doesn’t take a Hebrew scholar to notice that the word time occurs twenty-nine times in these verses. And a time to build up. Solomon begins his contemplation with a sobering observation: birth and death both have their appointed times. When my grandson, Ryland, was born, I flew to Baltimore for the event. As I peered through the nursery window at this beautiful new citizen of the world, it struck me that only a corridor away, some other citizen was being dispatched. Some family had gathered for the agony of farewell. It is not a lengthy walk between the nursery and the intensive care unit. We spend our own time making that trek between entrance and exit, womb and tomb. Meanwhile, there is a time to plant and a time to harvest. Solomon refers to the food supply because he knows that God sets the boundaries of the seasons. God has built certain rhythms into His world. The steady repetition of the seasons provides comfort and a workable cadence to life. We are a bit discomforted to read that there is a time to kill as well as a time to heal. Yet our bodies are in the process of dying every moment. Scientists tell us that every seven years we replenish all the cells within our bodies. There is an ongoing maintenance department in the human machine that is constantly changing out the old for the new. And it is governed by time. Cancer cells, infection cells, or simply worn-out cells must be killed — so even killing has its time, and we are grateful. There must be a time to kill so we might also have a time to heal. And what of “a time to break down, and a time to build up”? We build up in our early years, and we start breaking down as we get older — painful but true. How old is old? I was enjoying a birthday when David Todd, my six-year-old grandson, crunched the numbers on my age. He said, “If Poppy was a dog’s age, he’d be dead!” He was right. There is a time for breaking down, but God is there. He is as powerful as He is loving, and you have the opportunity to experience His power all the more effectively and vividly when you turn to Him in the breakdowns of life. How long could we wear one pair of sandals before the construction or materials deteriorate? Since the 1950’s the garment industry has manufactured what has become known as disposable clothing. Due to its lower production costs and cheaper materials, a substantial amount of our clothing is considered dispensable after a season. The concept of shoes and clothing with lifetime endurance is a foreign idea. “During the forty years that I led you through the desert, your clothes did not wear out, nor did the sandals on your feet” (Deuteronomy 29:5). When the Israelites wandered in the wilderness, their sandals and clothing were supernaturally preserved by God for four decades. From the very beginning of the wilderness journey, God delivered food from heaven with explicit directions of how to gather and prepare it. This sustenance became known as manna, a daily provision of balanced dietary nutrients the Israelites ate for the next forty years. Peter Jenkins, author of Walk Across America and The Walk West, walked from the east to the west coast of the continental United States from 1973-1979. During his prolonged walk, he wore out thirty-two pair of boots. He also wore threadbare a pair of sneakers in just eleven days while journeying across rugged terrain. Walking over rough ground erodes shoe leather from the exterior as perspiration deteriorates interior shoe components. Walking with a broken down pair of shoes can be dangerous. When all support from within the shoes is diminished, back and hip pain may result. A flopping sole could cause one to trip and fall. God eliminated any health hazard from ill-fitting, worn-out sandals during the Israeli’s wilderness walk by miraculously preserving their footwear. During their forty year march, the wandering Israelites wore the same pair of sandals and outfit of clothing, ate only the food God distributed every morning, and were protected from communicable diseases that could have swept through the camp of millions of people, devastating their population. “Remember how the Lord your God led you all the way in the desert these forty years, to humble you and to test you in order to know what was in your heart, whether or not you would keep His commands” (Deuteronomy 8:2). God established a covenant with His people, explained by an “if-then” formula. When the Israelites obeyed God, He blessed them; if they disobeyed, then God punished them. There were consequences for their actions. God “has watched over your journey through this vast desert. These forty years the Lord your God has been with you, and you have not lacked anything” (Deuteronomy 2:7). In response, the people consistently disobeyed and broke the covenant they established with God. Sadly, they suffered the consequences. In Genesis 14, we learn of the first recorded war in the Bible. When Abram was alerted that his nephew, Lot, had been captured by an alliance of rulers from surrounding countries, Abram amassed a small army from his household members to rescue Lot. With only 318 fighting men for his cause, Abram was greatly outnumbered. But, due to God’s help Abram developed military strategy that freed Lot along with all of the other captives. He then confiscated all the booty plundered by the enemy forces from the city of Sodom. Following the victory, the King of Sodom generously offered Abram all of the spoils of battle. Abram refused the gift, explaining that he had sworn an oath to God not to accept any of the plunder from the battle. Abram’s only desire was to save Lot and praise God for the victory. If Abram refused to accept the booty, the King of Sodom would be unable to claim any responsibility later for any portion of Abram’s riches. He wanted to give God total credit for any wealth he attained. Abram was completely obedient and for His loyalty and worship, and God rewarded him. Abram was eighty-five years old when God announced His plan to give him a son as his heir. God then took Abram outside to gaze at the stars, He promised, “So shall your offspring be” (Genesis 15:5). God later confirmed His promise to Abram: “I will surely bless you and make your descendants as numerous as the stars in the sky and as the sand on the seashore” (Genesis 22:17). It would be difficult to gain an inheritance that exceeded the generosity of God. Abram’s obedience was the compliance God expected from the children of Israel for whom He supplied all material possessions during their wilderness wanderings. God wanted His people to know that whatever wealth they eventually accumulated in the Promised Land would not occur as a result of their own efforts, lest their hearts swelled with pride and they forgot how God miraculously provided for them. Due to His provisions during their walk, it was obvious only God possessed the ability to feed, clothe, and maintain the health of His people. God wanted them to be constantly reminded of His love and faithfulness. “I did this so that you might know that I am the Lord your God” (Deuteronomy 29:6b). The Lord was testing His people’s obedience; most of the time it was lacking. God desires to interact in our lives as much as He was fully involved with the children of Israel. He cared for His people when they were wandering in the wilderness just as He promises victorious journeys to us in this current age. Whenever our Lord provides answers to prayers, protects us from harm, or performs a miracle in our lives, it is for the foremost purpose of shining His light in a dark world to bring glory to His name. The Israelites didn’t need a change of clothes or shoes; neither of them deteriorated for forty years. What miracles God performed in His children’s lives! It is His desire to do the same for us, to be intimately involved in every aspect of our lives. After all, aren’t we all wandering through this wilderness of life? It is best to travel with God’s guidance and provisions. “My God will meet all of your needs according to His glorious riches in Christ Jesus”(Philippians 4:19). Depend on His promises, for they are vast! What does it mean to glorify the Lord? It means showing off Jesus! Talking about Him, thinking about Him, singing about His goodness, pointing people to Him, letting all His attributes and character qualities shine through our lives. That’s what it means to glorify Him. The other night while lying in bed, I had the chance to glorify Him by just thinking about His goodness. I was pondering 1 Timothy 6:17, which says that He “richly gives us all things to enjoy.” Lying there, I magnified the Lord in my thoughts. I recalled how God’s hand of blessing often stopped and started in the Old Testament depending on the Israelites’ obedience. But then I thought of God’s New Testament way of doing things. Always blessing. Always giving. And always richly giving us all things to enjoy. Jesus is the manna always falling on the camp. He is the rock in the desert, ever sending out streams of life. He is the bronze serpent, lifted high, and always healing. He is the sun always shining. He is the well of grace constantly overflowing. Who ever returned from His door unblessed? Who ever rose from His table unsatisfied? Scripture says, “Praise the Lord, O my soul, and forget not all his benefits” (Psalm 103:2). The Lord Jesus is so good. Taste and see how really good He is. Drink deeply from the Living Water today… and glorify His name. I think we glorify the Lord best when we pass on His goodness to others. By God’s grace, you are His manna to others. You are His light shining in the darkness. You are the vessel through which His grace overflows. And out of you flow streams, rivers of life touching the thirsty world around you. The charge to us today is to richly give all things for others to enjoy. Father, help me to glorify Your Son this day as I watch for opportunities to touch, encourage, help, and strengthen other lives today by Your empowering and in Your great joy. Are we really content or do we pine away for what we don’t have but think we need? How can we find true contentment? I believe the answer lies in our perspective, our priorities, and our source of power. We are a tiny speck in God’s grand design, but He can see the bigger picture and knows everything that is going to happen to us before we ever do! I know of a writer who suddenly became quite ill. It took some time for the doctors to diagnose her illness and then she suffered through a long recovery period. During all of this, she never gave up. She firmly believed God would carry her through. In fact, she found contentment in her situation and praised God for granting her that period of rest and recuperation. She could have bemoaned her circumstances and blamed God for it, but instead she chose to use the time to get closer to Him. Afterward she said she could not wait to get back to her writing because she really had some great things to put down on paper based on what God had revealed to her while she was ill. What a good example of how we can turn something bad into something positive! She exhibited a peace and contentment that transcends all earthly understanding. Is God at the very top of our list of priorities? If we believe that God created all things, why can’t we remember that He can also guide us in all things? God wants only the best for His children and He reveals this to us in many ways. His love and care for us are evident as He works in us through the people in our lives, and through the Bible, prayer, the church, and the circumstances of our lives. How many times have we heard (and perhaps even said ourselves), “Why is God letting this happen? Why didn’t He do anything to stop it?” Suppose your child is fighting the ravaging effects of leukemia, or you go into work one day only to find you’ve been laid off. Where is God and how can we find contentment in situations such as these? As so often happens, the Lord wants to see where our priorities lie. Have we just been giving lip service to our faith and trust in God to provide for our needs, or do we really believe this? It is sometimes difficult, but that trust is another kind of contentment—knowing God will take care of us and resting in that knowledge without worrying about the outcome. What is the source of our power? Do we turn first to God for help or do we try to solve the problem ourselves? We can do nothing on our own. It is only through the strength of Jesus Christ that we can find any kind of strength at all! If you’re anything like me, you have struggled with an unruly shopping cart more times than you can remember The first inclination is to fight the rebellious cart, trying to “bend” it to your will—in other words, trying to make it move straight ahead instead of sideways. Usually we finally give up and exchange the stubborn cart for another one, hoping the second one will be easier to steer. Isn’t this similar to how we oftentimes react to God’s power in our lives? When He tries to show us the error of our ways in a particular situation, we dig in our heels and pretend there’s no problem. We might even turn away from God’s guidance. But when we finally allow God to do His work in our lives, there is a contented and peaceful heart after that struggle with what we know is right. The more we seek the Lord, the more faithful He is to grant us the emotional means to deal with our lives. True contentment is when we are in stressful situation but remain calm and at peace because we know He is with us no matter what. I saw a man in the supermarket yesterday using a new sporty wheelchair. When he zipped down the aisle, his chair didn’t make a squeak. I looked down at my big clunky twenty-year-old model with dirt on the frame and threadbare padding. Little wonder I looked with envy at his high-tech wheels. I’d like a trade-in on my wheelchair. Perhaps you would like a trade-in on your old car. Perhaps the grass seems greener down the street where they are building brand new homes. Yes, an automatic garage door opener and a trash compactor would be great to have. But sometimes when we compile our desires up against God’s desires for us, I wonder how many match. The apostle Paul says that he has learned the secret of remaining content despite either plenty or poverty. What was the secret Paul had learned? He gave it away in his next breath when he said that he was ready for anything through the strength of the One who lived inside him. Contentment is found not in circumstances. Contentment is found in a Person, the Lord Jesus. It requires a special act of grace to accommodate ourselves to every condition of life, to carry an equal temper of mind through every circumstance. On the one hand, only in Christ can we face poverty contentedly, that is, without losing our comfort in God. On the other hand, only in Christ can we face plenty and not be filled with pride. Lord, there are many things I desire, but I really don’t need. Subtract my desires and keep me from adding my own wants. Help me to find satisfaction in You, for only then will I find real and lasting contentment. Taken from Diamonds in the Dust by Joni Eareckson Tada. Copyright © 1993. Published in Print by Zondervan, Grand Rapids. and assurance about what we do not see. As I gazed out the window at the bleak winter landscape, I detected a definite lack of color, a bland outlook with no life stirring. With barren expectancy, we prepare our hearts for desolation, reflected in our attitudes and conversation. Are we so mentally programmed with gloominess that even our anticipation of future events is dulled? Comparing heart focus with environmental conditions is risky, thwarting inward hope and personal growth. It is easy to be affected by the lack of sunshine and warmth in winter. Let us not permit exterior influences to eclipse the radiance with which Jesus penetrates darkness by reflecting His light through our lives. Joy is quickly extinguished by despondency. “Now faith is confidence in what we hope for and assurance about what we do not see” (Hebrews 11:1). After Jesus’ disciple, Thomas, conquered his disbelief at Christ’s post-resurrection appearance, Jesus taught the eleven disciples, “Because you have seen me, you have believed; blessed are those who have not seen and yet have believed” (John 20:29). In today’s vernacular we would explain Jesus’ teaching as “blind faith.” In spite of our circumstances, our beliefs don’t change; they are locked securely inside our hearts. Faith in God is the consequence of trust; trust the outgrowth of belief. If we constantly focus on the negative, our hearts will languish with despair. We’ve all been exposed to a curmudgeon who projects a pessimistic approach so hopeless that black clouds spontaneously open, dispensing chilly water on a new idea. Cynics have an intimidating influence on positive thoughts, much like the austere environment in winter. With whom do we communicate to enliven a joyful spirit? God is the Author and Creator of all things good. “Jesus answered, ‘No one is good except God alone’” (Mark 10:18). The good God constantly imparts to us is a reflection of His own divine character of purity and holiness. After gazing outside at the monotonous winter panorama once again, rather than a change of scenery, I discovered the need for an attitude adjustment. God has the ability to change our perspective with His gifts of joy and peace. Man is unable to conjure up sovereign gifts independently with the power of positive thinking, as some assert. We must depend upon our Lord to supply us with His limitless gifts, always available to those who seek Him. “Take on an entirely new way of life—a God-fashioned life, a life renewed from the inside and working itself into your conduct as God accurately reproduces his character in you” (Ephesians 4:24,The Msg). We are commanded to fellowship with God, the glorious, victorious Creator of life and peace, joy and light, grace and love. In the new year, let us establish enlightened priorities, recognizing the capacity to alter our lives forever by placing them in God’s care. “Submit yourself, then, to God. Come near to God and he will come near to you” (James 4:7a-8). Winter, with its unique season of dormancy and hibernation for many living things, is also a period of refreshment, preparing for regrowth; for a magnificent burst of beauty and fragrance that identifies the imminent season of spring. Let us not bear winter grudgingly, but joyfully use the time to develop attitudes pleasing to God. There is beauty during winter unseen at other times of year. Shadows on snow peek around trees, marching like toy soldiers as the sun manipulates the imaginary forms. Sunsets of magnificent proportions and beauty light up late afternoon skies with unequivocal displays of prismatic colors. The deep green of softwood branches and the silhouettes of stark hardwoods in the foreground of high, pristine snowbanks create fantastic visual delights. A full moon illuminates light blue blankets of snow when the dark draperies of night are pulled down upon the world. What do you envision in the winter season of your life? The bleakness of financial, health, or employment woes, or the unprecedented power, protection, and provisions offered by God Himself? The new year holds unimaginable possibilities and victories. Seek an attitude that reflects Jesus’ submission, humility, and obedience toward His Father. “Abba, Father, everything is possible for you. Take this cup from me. Yet not what I will, but what you will” (Mark 14:36). Jesus could release His deepest hope to His heavenly Father, assured that even at such a late hour God could perform the impossible by cancelling His Son‘s crucifixion. Yet, Jesus believed that His Father’s perfect plan would be accomplished. Christ was convinced that His hope wasn’t misplaced by cross-your-fingers wishful thinking, but as confident expectations resting on God’s promises, free of worry and nail-biting. Jesus trusted in God’s sovereign ability to answer his prayer custom designed for His Son alone. He does the same for us. Hope is like an restraining anchor at the bottom of the sea. The Christian anchor rises up into the heavenly realms, guaranteeing our personal security. We are sheltered by our sovereign refuge. It is essential for us to value God above all else in our lives. He freely extends joyful delight, anchoring hope and unconditional love. Ask God to transform your priorities. He will lavish you abundantly with the righteousness of Jesus. To live right before God (righteousness) is His ultimate goal for each believer. “The Lord delights in those who fear him, who put their hope in his unfailing love” (Psalm 147:11). Hope is expressed when we turn toward God with confident expectation during times of trial. “And the peace of God which transcends all understanding, will guard your hearts and your minds in Christ Jesus” (Philippians 4:7). With inner tranquility, believers relinquish their worries to God and dwell on them no more. Then the victory of God is theirs to enjoy. The full dimension of God’s love and provisions are beyond our comprehension, motivating us to trust Him explicitly. During one final peek outside, I focused on the glory of God’s creation. Just as the outside world perpetually changes, believers also experience consistent growth and renewal deep within their hearts. We learn patience and perseverance, but most marvelous of all is the imperceptible growth in hope, trust, and faith our Lord accomplishes by His power at work within us, transforming our lives. Expect the unexpected from an exceptional, extraordinary God!